Boneless Strips... the ultimate cookout steak! Cut from the heart of the short loin, our well-marbled Boneless Strips are bursting with juicy flavor and aroma that come to life on your grill or broiler. 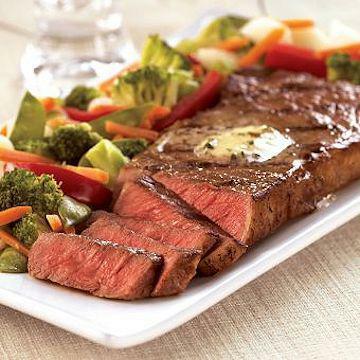 For the ultimate steak experience, try these Boneless Strips today! The cooking times below are in minutes and based on using fully thawed steaks. times below. Allow 3-5 minutes resting time before serving. Apply finishing sauce or glaze if desired. Thickness 1/2" 3/4" 1" 1 1/4" 1 1/2" 1 3/4" 2"
Preheated Oven Broiler - place pan 2-3 inches away from the broiler heat source.